Today I’m sharing some midweek inspiration over on the BLOG along with other fab creations from the team. 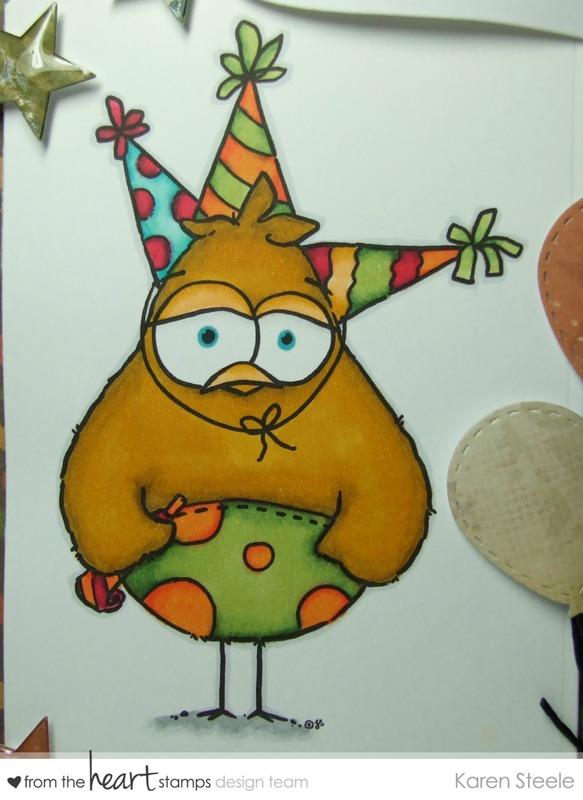 For my card I have used this great image called Party Hat Birdbrain – he’s not looking too thrilled is he?!! As soon as I saw this digi I knew it would be perfect for my Brother-in-Law – he’s not big on celebrations (lol!) and this Birdbrain’s face say’s it all doesn’t it?!! This image comes with 7 fun sentiments too! I also used papers from Recollections – Awesome Boy, Spellbinders Banner Die, Epiphany Star Tool, free balloon die from a magazine, twine, WRMK Corner Chomper and Spectrum Noirs to colour. This super image is only $1 to buy in the store at the moment – or free if you spend over $10 and you use the code to claim your free image 🙂 If you played along with us last month you should have received yours for free via email. Rules for our progressive Stamp of the Month Challenge and our weekly sketch challenge can be found HERE. 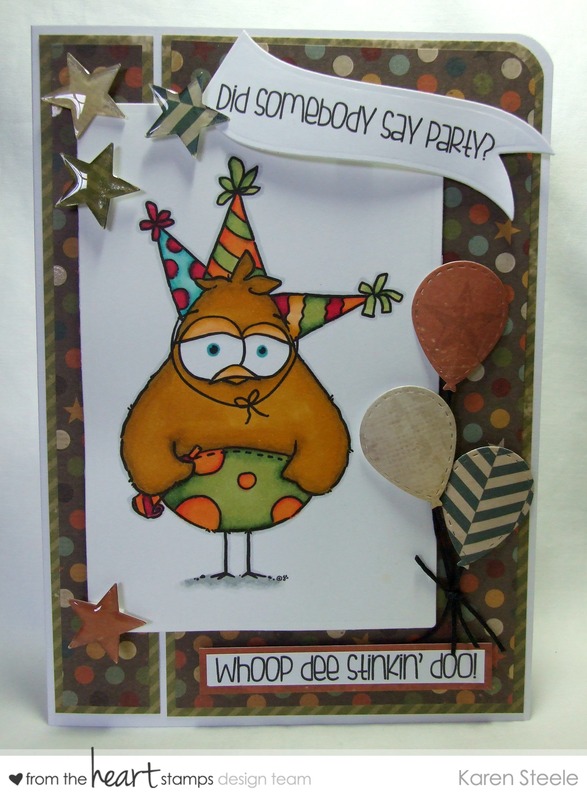 Next > Chilly Willy Bella…..
Hehehe…CUTE card with the bird and all the party hats!! Fun sentiments, too!!! Sweet – This little guys can definitely be used in sooo many ways – I love the layout too – that little rounded corner is awesome! That stitched ballon die was a freebie? Wow, that’s a great one,sorry I missed it. Super sweet card with fun detailing and love the bird’s facial expression. Hee hee Too cute. I like the colors and your papers. Very fun card. Karen, I love what you did with Birdbrain. He is definitely expressive. But I’m thinking he should be happier as beautifully colored as he is. Great card! He is too cute and what a perfect color combo. Also, love how you captured the glossy goodness on the stars! FUN card, Karen and great layout ! !